TNG is a web-based TMS (Telephone Management System) that allows you to identify and manage problem areas of your business telephone account. Its ‘Drill Down’ report functionality ensures that all information – from summarized to detailed – is available on a single report. You can view a summary report and drill down multiple levels to the detailed calls from within a single report without the need for any reloading or extra searches. 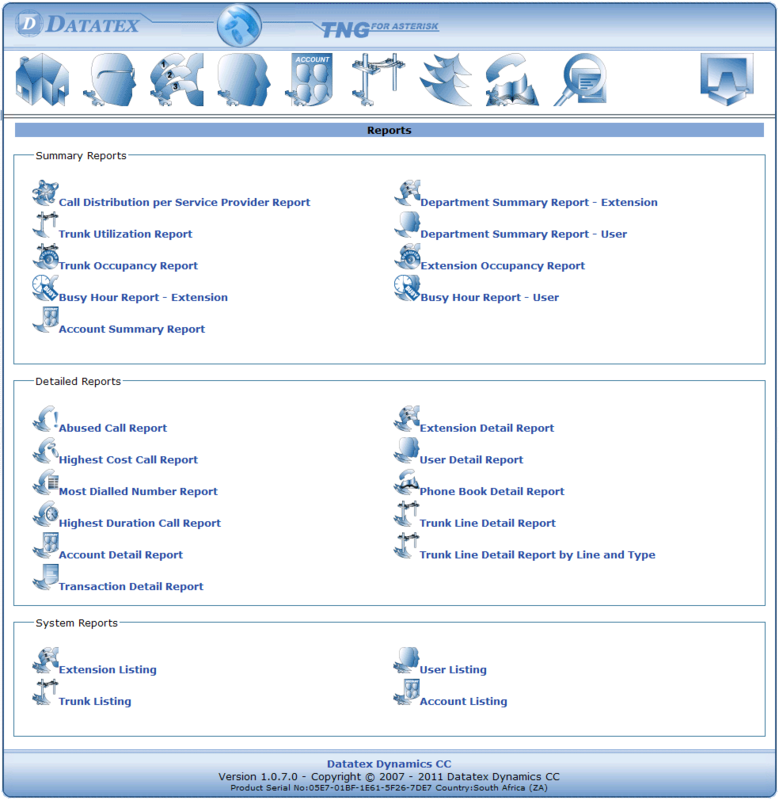 Summary reports contain drill down features to the detailed level. Installs on a single PC. Departmental head access levels can be limited to specific only or full access including general maintenance. Export data in real time for third-party applications through a TCP port and text file. Fast non-database system to ensure reliability, reduce report generation time and enhance overall system performance. Automatic deleting and archiving of old data. Simple and powerful rates system. Cost comparison between service providers with our call-costing calculator. Phone book facility to categorize, identify and search for telephone numbers. Supports both account codes and pin codes. Data Buffer warning can be enabled to let you know when the memory is almost full. Data Buffer supplied as standard with TNG. Windows 2000/XP based systems or Linux. 20 Megabytes of available Memory for every 25000 records stored live. Web browser on each PC that needs to access TNG. A UPS is strongly recommended on the PC or server where TNG is installed. Go to TNG website for more information on TNG.